THE GARFIELD STUFF STORE > GARFIELD'S KITCHEN > Garfield Cookbook: Recipes With Cattitude! The first new Garfield cookbook in ten years, Garfield...Recipes with Cattitude! is packed with over 230 yummy recipes near and dear to Garfield's tummy. Garfield and "Garfield" Characters © Paws. All Rights Reserved. Save 20% off your order from the Garfield online shop, excluding shipping charges, gift wrap charges and applicable sales tax.Coupon code POGO must be entered at check out. Promotion starts on March 20, 2012 at 12:00 a.m. (PT) and ends on March 26, 2012 at 11:59 p.m. (PT). 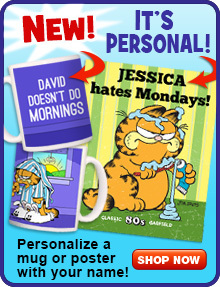 All orders must be from the CafePress Garfield shop and added to cart from URL beginning with: www.cafepress.com/garfield. Excludes CafePress marketplace purchases (e.g. all products added to cart from URLs beginning with the following (i) http://shop.cafepress, (ii) https://t-shirts.cafepress and/or (iii) http://www.cafepress.com/sk/), Gift Certificates, Flip products, SIGG bottles, Dreams products, Fathead products, and CafePress Make, and bulk orders. Offer valid online only, cannot be combined with any other coupons or promotions and may change, be modified or cancelled at anytime without notice. This promotion cannot be applied to past orders.